Had an interesting experience over the weekend. I have just got back from Scotland and thought I would clean and check my bike ready for a run out. 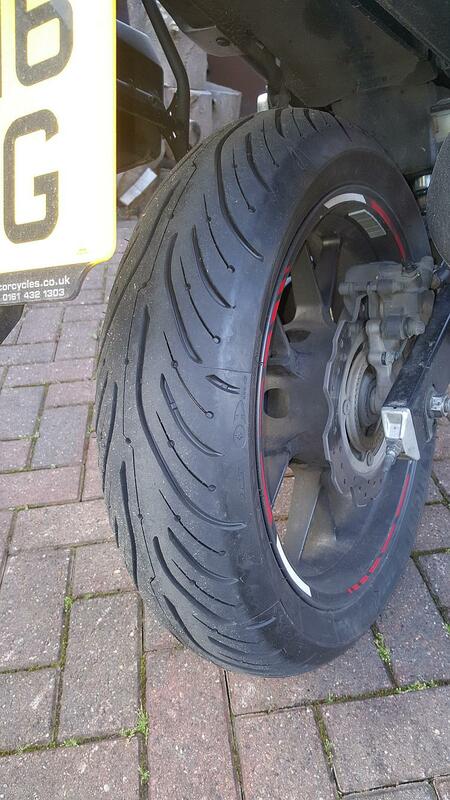 I washed and cleaned the bike and got out my pressure gauge and shock horror the rear tyre was at 14psi. I Pumped it up and decided to clean the rear wheel. On closer inspection I spot a big metal object in the tyre. Looks like a nail or screw right on the edge. A check of the pressure 10 minutes later and it's back to 21 lbs. Damn. I now call out the AA. He arrives and says sorry we don't fix bike tyres and I'm not geared up for a bike recovery you need to ring again and ask for a bike recovery. A few searches on the internet reveal no one seems to do mobile on the drive tyre fitting in my area. God that's hopeless. I ring a few shops, no one even has the tyre size in stock. Oh dear. Then I get the message you might need to change the front as well to match. I ring my bike supplier who says the same and ask if I can get the rim to them. I explain it's on the bike and I will get the AA to bring the bike. They don't want the bike clogging up their workshop only the wheel will do. So with a brain wave I decide to remove rear wheel. I sit and watch a Youtube video and then with great confidence use my new half inch draper ratchet and 24mm socket to remove the rear tyre. 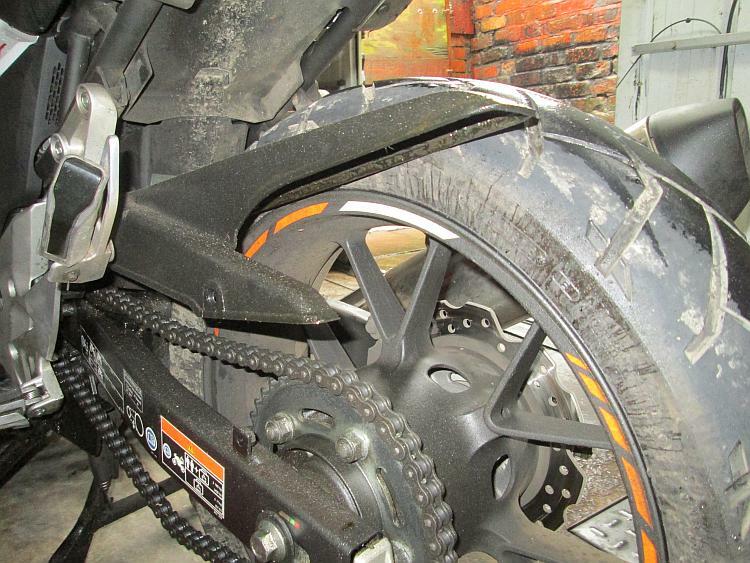 I wriggle the chain off and wriggle the tyre out from the brake. God it's not very simple, I hope the video tells me how to put it back on again. By this time the AA Bike man arrives and he's really impressed with my tyre removal and says he can repair the tyre. 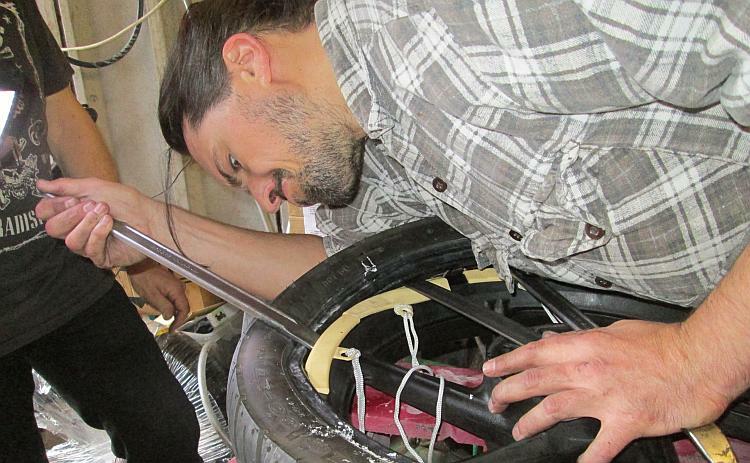 He removes the tyre which has a nail straight through but horror its gone in at an angle and punctured the side wall. Tyre rendered junk I'm informed. No repair but I can take it to my local shop who say they can order me the tyre. I leave it with them. But lesson learned - good job I tested the air pressure and cleaned my bike. Having looked at the reviews of available tyres the Michelin Road Pilot 4 seems very popular if a little expensive. The saga of the tyre continues. A week later I go to pick up my tyre and am shocked to discover they have ordered me a front tyre as well. They are very nice about it and point out that the front is pretty worn down anyway and that you really should match up the tyres. I agree and bang out the Debit card. 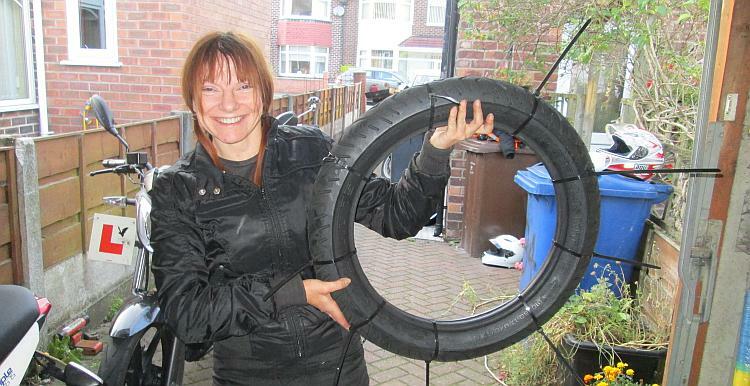 I take my shiny new tyre with me and of course their is no video showing me how to put the tyre back on. After much anguish and oily hands I figure it out and of course make a phone call to Ren for advice. I get the wheel on and then have to figure out how to ensure its on level and balanced each side. This is fine and I take it gingerly for a spin. Yes, great, I vary the speed and everything seems fine. I then have to repeat this for the front wheel. Of course I dont have an Allen Key big enough to fit the 17mm front spindle. So again after much puzzlement it's off to Halfords, the biggest they do is 12mm. Toolstation do 15mm. A couple of phone calls reveal no one has one in stock in Manchester. So I order on EBAY and have to wait for the damn thing to arrive. 3 Days later it arrives and it's going to be simple to remove the front. God the Clamp nut on the bottom of the fork simply will not budge. I spray it with WD40 and leave it overnight. Still wont budge, its pretty stupid actualy that this bolt faces forward into the spray and crap off the road and yet its made out of very soft metal. I eventually get it off and round the face of the bolt a fair bit. Of with the wheel and or course I cant the the wheel out. Damn I forgot to take off the caliper. I do this without problem and the video I watched says these bolts should be replaced according to Honda. Again they look a bit crap so I order them online along with the clamp bolt. Tyre duly removed and the pads look ok. I think they will be my next DIY task, might be able to bribe Ren with a free meal and gallon of tea. Drop it into the shop. Damn working all week so will have to wait till Saturday to pick it up. Next days Hunts Honda in Burnage Manchester ring me to say my tyre's ready and balanced. I tell them I cant come for it till Saturday. No problem they say one of the lads (Scott) lives near me he will take it home with him and I can pick it up from his house. Wow great customer service. Tyre duly fitted without too much sweat and bitten nails. I take the bike for a couple of spins and it seems fine. I do 20 miles rather gently and suddenly realise that the bike is actually transformed. It now handles really tightly it will lean over and hold a line despite the tyre being new and not scuffed in yet. The next day is a Manchester Monsoon and my god what a difference two up to work with my mate and the bike handles like a dream. No white lining unlike the old Dunlops. Bumps don't seem to affect it as much and I can actually lean it over in the wet. 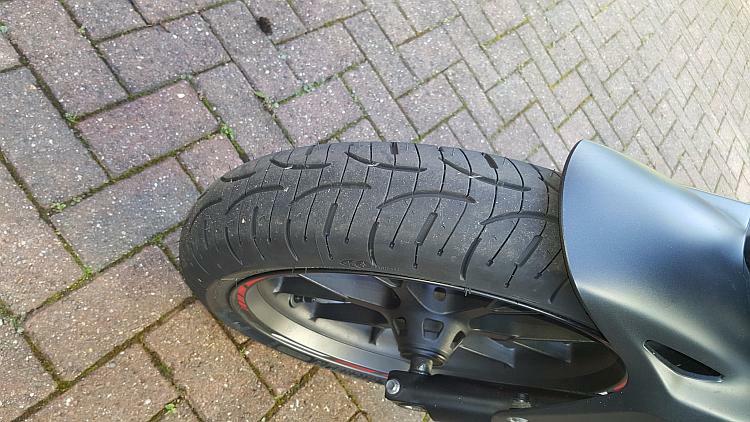 These tyres have to be the number one improvement you can make to a CB500X. Yes I know I'm not going off road with it but now it's a delightful handling bike in both wet and dry, all of a sudden I feel very confident around the bends. What do you think of your tyres? We'd like to share your own review here on Bikes And Travels. Drop Ren a line via ren@bikesandtravels.com. Nice one, you have now ventured into the world of motorcycle DIY, just shows that with a bit of confidence a job can be done without being beaten. When I replace nuts and bolts I use stainless with a bit of coppa grease, they don't rust- ever, do give them a go they are also cheaper than manufacturers items. You are right about the transformation in handling, this is the case whatever tyres you choose to fit, due to the very gradual demise of your old tyres, I've been riding 39 years now and I am always surprised at my 'old' bikes new handling characteristics when new rubber is fitted. 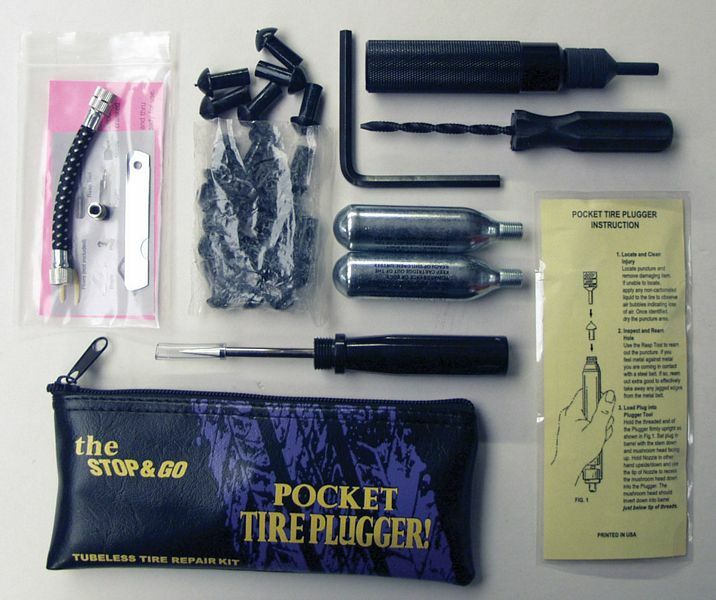 Could I reccomend one product to you, it's called 'pocket tyre plugger' and it is quite simply a puncture outfit that saves so much time and messing although it is only a temporary solution. You can repair your punctured tyre without removing the wheel and inflate it with the gas cartridges supplied, I have used this on my bike and friends bikes several times. Latchy - you're right replacing worn out tyres always transforms a bike so doing a tyre comparison is nigh-on impossible unless you change new for new back to back. *BUT*!! Even taking this into account the original equipment Dunlop Trailmaxes are bloody awful. As for the puncture repair kit - yeah they're a cracking tool, probably the best of the lot and definitely better than the "worms" that I currently have. Thing is if as in Pocket's case the nail has gone into the side wall then you're screwed. New tyre time. As for replacing bolts, stainless are brilliant. You don't need an Allen key. A drain plug remover like the link is far better and small enough to carry on the bike. As you will all know, being a tubed tyre, the plug method is not an option. I've now fitted a new tube courtesy of an ex-MZ riding friend and the wheel is waiting for me to refit it. I always fit new tubes rather than mucking about with patches. And the MoT? Passed of course. I'm not right sure about your MOT inspector Ian. I, personally, would consider a flat rear tyre an MOT failure under normal circumstances. Nothing said about it being inflated. Well I never! I stand corrected in my orthotic shoes. Hey Pete, had you actually been riding the bike on your Scotland trip? If so, I'd be staggered to learn you didn't "feel" the missing 28psi. I can detect 2 or 3psi deflation. I have always been a fan of the Pilot Roads from the day they were introduced and my primary reason for choosing them is their wet-weather performance. They also last a long time! 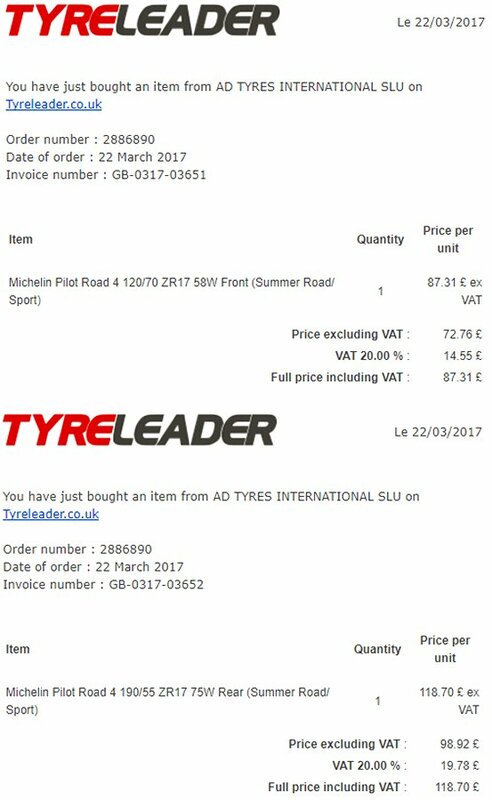 I got mine pretty cheap from TyreLeader and had them fitted within an hour of them arriving by V-Twin Motorcyles in Horwich. I like saving money as much as the next man, but all that farting around and wasted riding time is not for me. Wish I had been riding in Scotland. I don't seem to be able to detect minor alterations in pressure especially on the Dunlop which gave no feel whatsoever. The Michelin are different you can actually feel the road and the tyres. They don't skid on white lines are much better in the wet. You do feel the bumps and road surface much better so I hope if they do drop pressure I stand a chance of detecting it. That said I'm checking my tyres virtually every time now.